The Country Gospel Music Association is all about Love. First of all it’s about the love of our Savior Jesus Christ and sharing His love through entertainment, song and music. This beautiful organization embraces musicians at any level of their career and loves, encourages and enjoys seeing their talent blossom by sharing their love for the Lord and others through their music. The Annual International CGMA Convention will be held in Branson MO at the Stone Castle Hotel, October 3rd through 8th. James Marvell a former Branson entertainer, one of the first members of CGMA with a history of Theater Worship Services in Branson is honored to be part of the worship, fellowship and fun which is always a part of the convention. Marvell will be performing his November release “Time For Anew” written by Dennis DiChiaro. 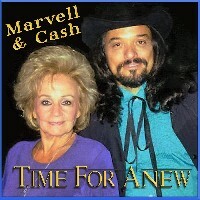 Johnny Cash’s sister Joanne Cash will join James Marvell on the song by way of digital technology. The 20th International Country Gospel Music Association Convention is free to the public. Come help us celebrate. We hope to bless everyone with worship through great country gospel music. Monday-Saturday, International Showcases awards and more start at 5:00 pm daily. Red, Hot & Blue features multi-talented entertainers that take your group through the decades with over 100 costume changes, hilarious wigs, reminiscent video footage, and more! From Big Bands to Boy Bands and the Beatles to the Bee Gees, don’t miss this high-energy, non-stop performance guaranteed to make you tap your toes. Calling all Monopoly® Real Estate Barons and fans from 14 to 104; get ready to once again compete in the ultimate real estate trading competition. OACAC (Ozark Area Community Action Corporation), Stone County, will be hosting the 8th Annual Southwest Missouri Ozark Mountain Monopoly® tournament and silent auction, Saturday, October 15, 2016. The event begins at 9:30 am at the Best Western Branson Inn & Conference Center, next to Silver Dollar City. Player fee is $20 per person. Pre-registration is advised as only the first 120 registrants are guaranteed to play.The registration fee includes a player position at the tables, food, and beverages, as well as, a tournament t-shirt. Each player will have two 90 minute rounds of play. Those interested in individual, business, or corporate sponsorship of a table or to get the company name on the back of the shirts should contact Cy Bortner at 417-294-7528. All proceeds from this OACAC sponsored event will go toward the local Stone County Neighborhood Center Emergency Fund. Some of the ways OACAC Neighborhood Centers help the community are by helping low income families set and reach education and employment goals, as well as, targeted coaching in Life Skills, Parenting Skills, Budgeting and Nutrition. They also help with Energy Assistance and Senior Citizen Services. OACAC Neighborhood Centers have been serving Southwest Missouri communities since 1969. This Ozark Mountain Monopoly® Tournament and Silent Auction is a fun and exciting way to raise money for a great and worthwhile cause. Registration forms are available at the Stone County Neighborhood Center, 15060 Business Hwy 13, Suite 11, Branson West, MO 6573. PDF registration form as well as, directions to this event are available by emailing ozarkmountainmonopoly@oacac-caa.org, please use “Registration form & directions” in the subject line. Also visit ozarkmountainmonopoly.com for complete information and to download a registration form. For any questions about this event please contact Zana Schafer at Stone County OACAC, 417-739-1130, or email questions to the address above. Do you want to know about the businesses and services accessible to you right here in the Branson area? Do you want to have fun shopping and help the children of Taney County? The second Branson Women’s Expo will be held at the West Wing Conference Center (White House Theatre) located at 2255 Gretna Rd on October 22-23, 2016. The event will promote a mixture of local businesses and direct sales opportunities with the common focus of health, home ideas, and style trends – all of which give women something to feel good about! The Branson Women’s Expo will run Saturday, October 22 from 10 am-6 pm and Sunday, October 23 from 10 am-3 pm. Women will have the chance to connect face-to-face with trustworthy financial experts, insurance professionals, home décor specialists, health and beauty consultants, and of course to shop to their hearts’ content. Get a jump-start on your holiday shopping with local and regional exhibitors offering everything from essentials to little personal luxuries. There is something for every woman at the Expo…whether you are looking for inspiration, relaxation or to get help managing life’s details, you’ll find the resources needed. You will be helping the children of Taney County as you purchase the $2.00 entry ticket at the door, all of which will go to the Junior Auxiliary of Taney County (JATC). Paid admission not only provides a donation to JATC and access to more than 55 vendors, but also a great goodie bag supplied by the sponsors containing magazine, coupons and other promotional items. More than 55 vendors will be able to participate in this event, including AAA Insurance, Arbonne, Cecilia’s Samplers, Damsel in Defense, Jamberry Nails, B&L Outdoor Power Equipment, 417 Fundraising, Lavender Falls Farms, Nerium International, Missouri Baptist Childrens Home, Mix Party, Penrod & Company, Pure Romance, Rodan & Fields, Tastefully Simple, Tupperware by Billie, Victory Chiropractic, to show and/or sell their products. And once again, Usborne Books & More has generously offered to donate 50% of their proceeds from sales that day to JATC. Businesses such as Cox Health, The Vacation Channel, Tanger Outlets, KRZK-FM, 102.9 and KOMC are the generous sponsors. More information is available at www.bransonwomensexpo.com or contact Ozarks’ Kirkwood Hospitality at 417-335-4668. JATC has been selected as the sole beneficiary of this second Branson Women’s Expo. Check out the organization’s website www.JATCMO.org to find out more or to get involved. Currently, JATC members support and operate eleven projects including Women’s Crisis Center; Santa’s Gift House; College scholarships; Learners Today-Leaders Tomorrow, providing materials and support to enhance science, technology, engineering and math (STEM) studies at Bradleyville Elementary School; prom dresses for girls in need; stuffed animals for children in the local hospitals; Homework Helpers and Book Swap Stop, in which they provide snacks, enrichment programs, reading and homework help for children who live in extended-stay hotels/motels; and Heart of Arts, supporting arts activities for clients of the Developmental Connections Center. JATC is more than a nonprofit organization, it’s a group of women united by a single cause and dedicated to helping the children of Taney County. That’s the magic of JATC. Approximately 50 members annually contribute more than 4,000 volunteer hours as they strive to improve the mental, physical, social and emotional well-being of children in Taney County. JATC is part of the National Association of Junior Auxiliaries (NAJA), a non-profit organization founded in 1941 with headquarters in Greenville, Mississippi. NAJA has more than 15,500 active, associate and life members in 98 chapters located in Alabama, Arkansas, Florida, Louisiana, Mississippi, Missouri, and Tennessee. The NAJA Graduate Scholarship Program has awarded more than $1,203,859 since its inception in 1963 to persons who work, or plan to work, directly with children. NAJA’s slogan is “Care Today-Character Tomorrow”. This is Branson’s most dazzling musical extravaganza for 2017! It’s the all singing, all dancing, glittering salute to the best of Broadway. Direct from London, England, Broadway’s Greatest Hits, is the smash hit that brings you fabulous, exciting highlights of the greatest Broadway musicals of the last 50 years. Imagine visiting New York City and wishing you could see all of your favorite shows in one evening – now you CAN with Broadway’s Greatest Hits at the King’s Castle Theatre. You’ll enjoy spectacular highlights from some of the greatest Broadway Musicals of all time including 42nd Street, Phantom of the Opera, Les Misérables, Cats, Chicago, Oklahoma, My Fair Lady, A Chorus Line, Wicked, Hairspray, Momma Mia… and many more! This breathtaking production is the number one must see in Branson. A new Magic show is opening in Branson this weekend at the Music City Center! “Mystique” is a brand new show in Branson Missouri featuring many classics of magic along with mystifying illusions and death defying escapes. And the 1st 2 nights are FREE to locals on Friday September 16 & Saturday September 17 at 8 pm. Up Close Concerts has had a busy year in 2016 with some incredible shows, Charley Pride, Jay Leno, Ronnie Milsap, just to name a few. And now they are proud to announce Kris Kristofferson will be performing at the Welk Resort Theatre, April 7, 2017! This is his first Branson appearance! Born in Texas and raised in a military family, Krisofferson studied creative writing at Pamona College in California before earning a Rhodes scholarship to study literature at Oxford, where he boxed, played rugby, and continued to write songs. After graduating from Oxford, Kris served in the army as an Airborne Ranger as a helicopter pilot. 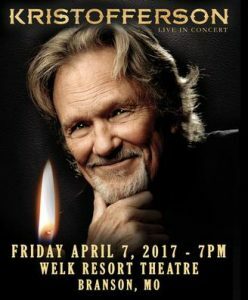 In 1965, Kris turned down an assignment to teach at West Point and moved to Nashville to follow his dream and pursue a career in music.